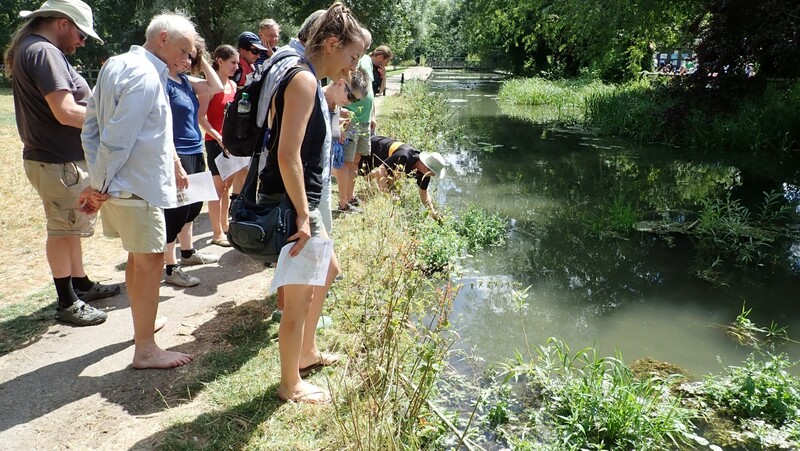 On a glorious summer day, 21 participants joined us for the pennywort pulling working party, supported by funding from Cambridge Water’s PEBBLE fund. With fantastic help from Cambridge Canoe club and their members, we had a fleet of 11 canoes out on the river, plus a team working from the bank in Grantchester Mill Pond. 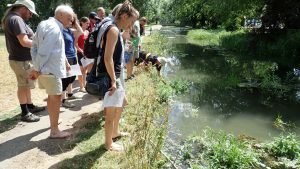 We started with some instruction from Mike on Floating Pennywort, and how to distinguish it from other plants, using a handy patch in the nearby Snobs stream. 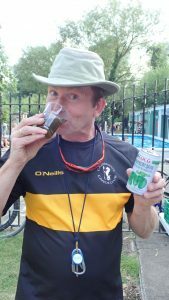 We then finished with some refreshments… Pennywort drink from Cho Mee supermarket was interesting to try (and is apparently good for arthritis) but more conventional drinks were more popular! 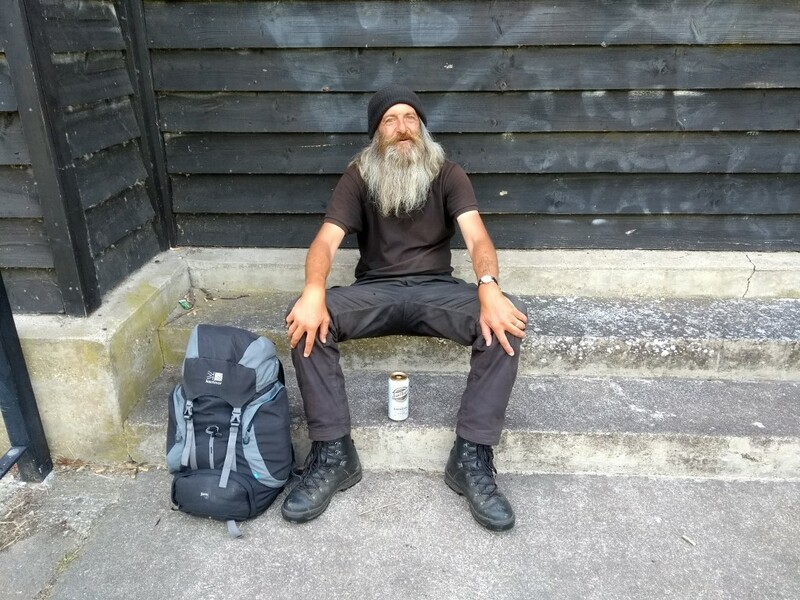 Here is Ed, who keeps an eye out for it between Sheeps Green Cambridge, and Fen Ditton. Do say Hi if you see him. 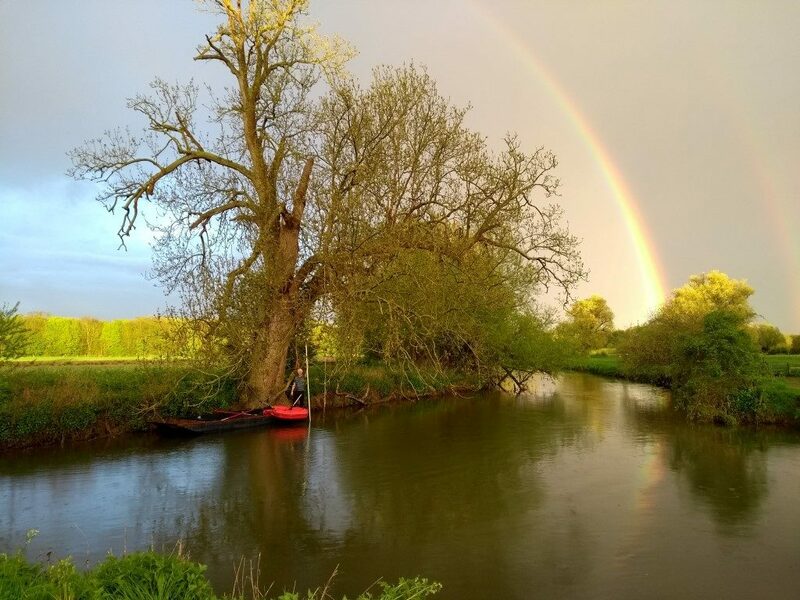 Simon takes a large punt up river under dramatic skies, ready for the start of the first Pennywort Hitsquad. 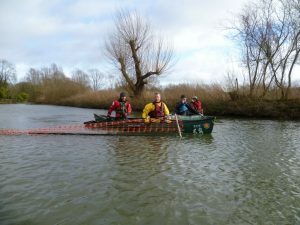 These are follow-on sessions from the Treeworks, with our contractors ML Partnership spending 2 days working their way down the river in a giant punt on loan from Scudamores. 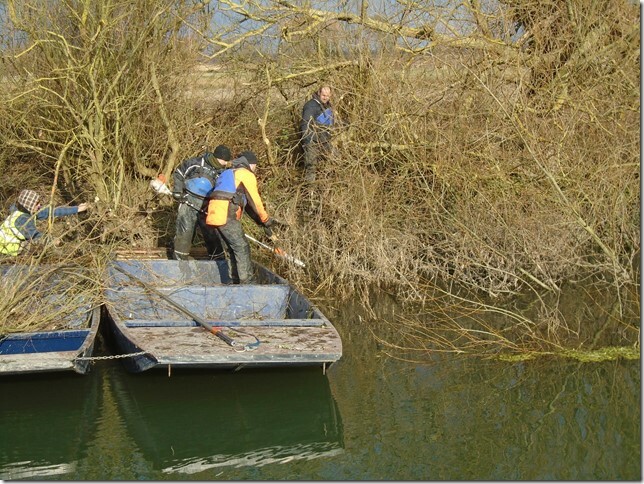 Their tasks are pulling out some of the remaining trees that had rooted in the river, removing pennywort-containing-debris, and pulling pennywort. 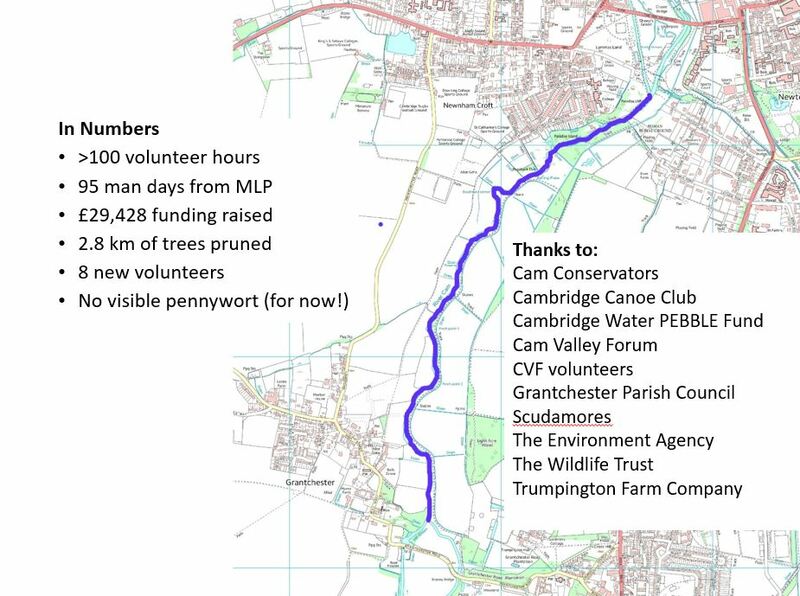 We have funding from Cambridge Water’s PEBBLE fund and South Cambs Wildlife Enhancement Scheme to run 3 more of these, as needed during the summer and Autumn. Very pleasingly, thanks to all the work in February and March, there’s currently no pennywort for them to pull, but we know it will appear soon…. 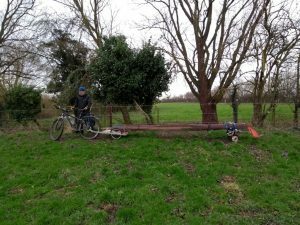 Cam Valley Forum’s 2018 Pennywort Pulling Working Party has been postponed from May to July, due to a very pleasing lack of pennywort to pull! 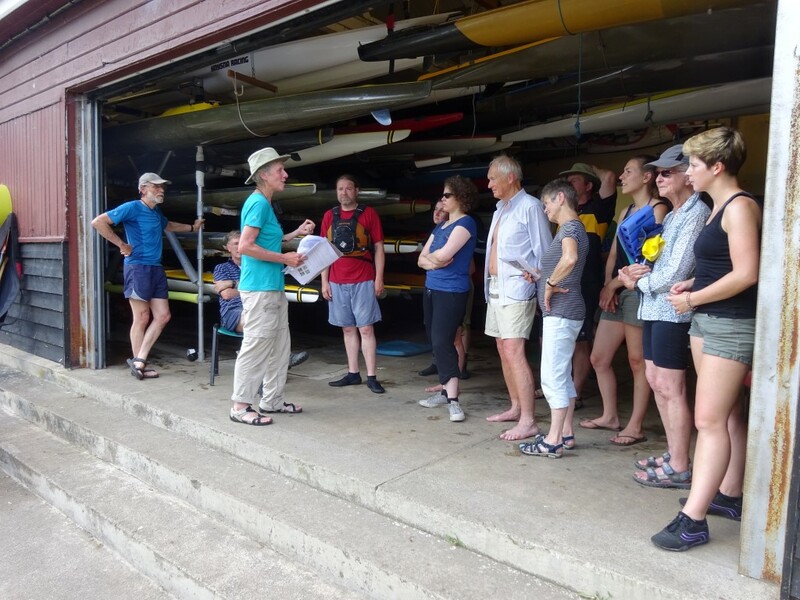 New date is Sunday 8 July, 1:30pm outside Cambridge Canoe Club, followed by refreshments. Do come as a group or as an individual. If you have them, please bring rakes, buckets, punts etc! For details and to book (which helps us plan and gets you a reminder) click here. With thanks to all our funders, and the hard working team from ML Partnership, we’ve now completed 2.8km of treeworks and pennywort clearance on the upper Cam. The team have cleared all the way from the Grantchester Mill Stream to Lammas Land Car Park in Cambridge. Beautiful, but too cold and slippery to work for much of this week. 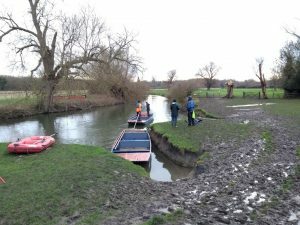 The Environment Agency visited last week, and were so impressed they’ve awarded us/The Wildlife Trust extra funding to allow work to continue downstream, hopefully all the way to Mill Lane, Cambridge. MLP have developed a slick working method and are making good progress. 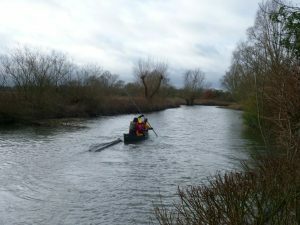 In the picture above they are working from right (upstream) to left (downstream). 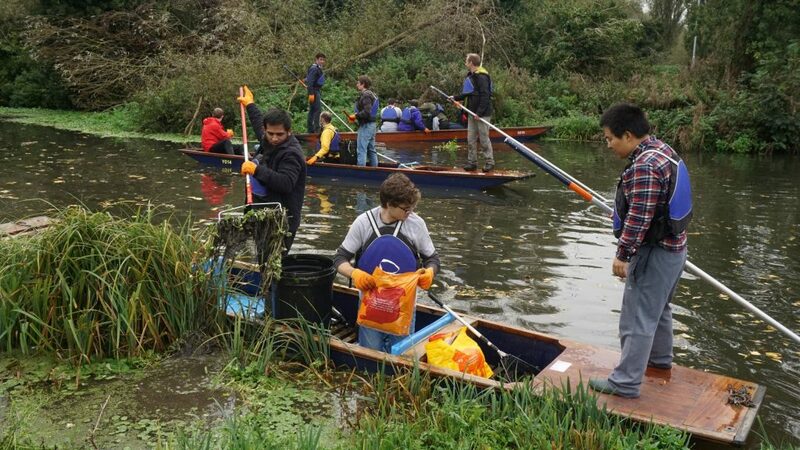 The workers are just visible behind the punts, loading them up with brush and pennywort. The punts are then pulled across the river using a fixed rope to be unloaded on the opposite bank. The debris is left in piles for the farmer to remove or chip. The light green patch on the left of this picture is Floating Pennywort. We are deliberately leaving a few “habitat refuges” for birds and fish. 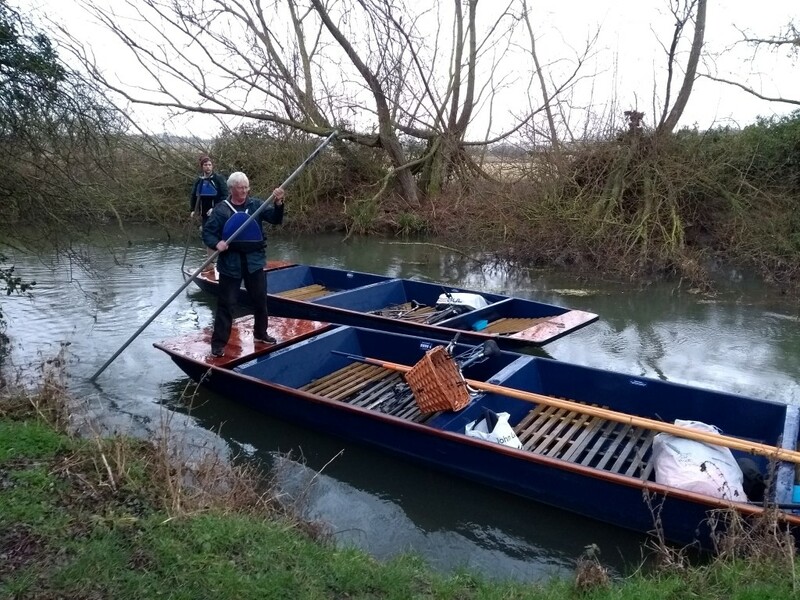 With the help of the Cambridge Canoe club we are installing protective barriers, which will hopefully stop them becoming completely clogged with Pennywort….. But we’ll find out later in the year whether this works. 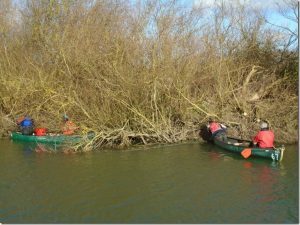 In preparation for the treeworks, Cam Valley Forum and Cambridge Canoe Club have installed Cam Conservators’ chicane boom system. 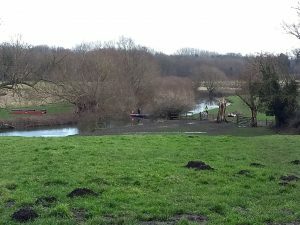 This is in the same position as Cam Conservators installed it last year, between the River Bank club and Grantchester Meadows. 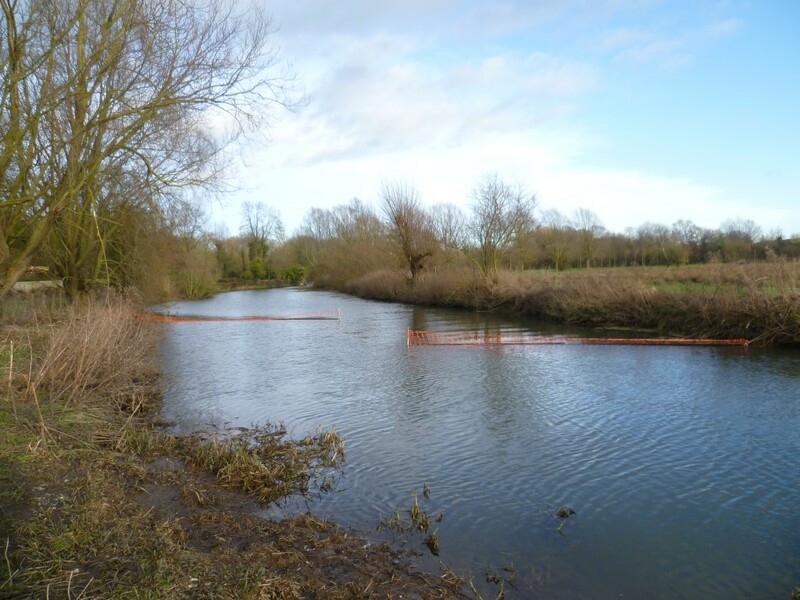 These booms are designed to catch Floating Pennywort that is released during the treeworks. 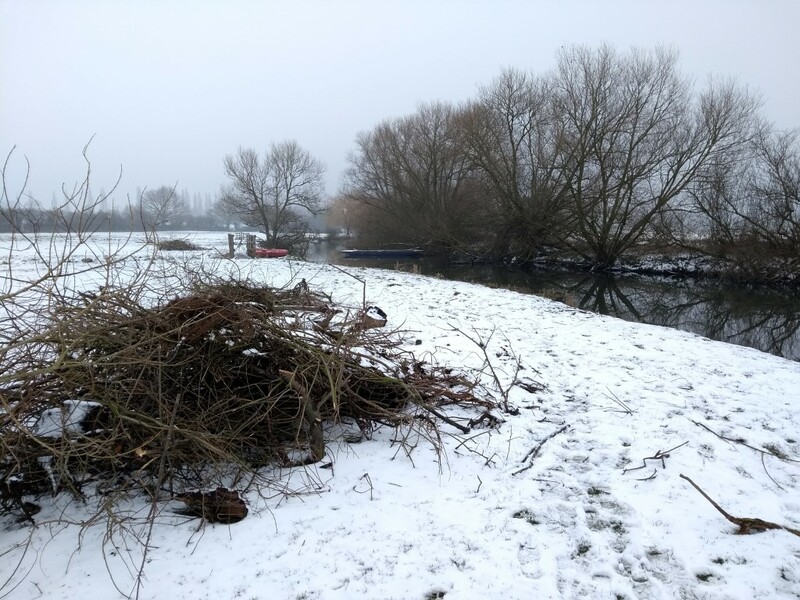 Ideally the debris will all be channelled to the West bank where it can easily be removed from the bank with rakes, or by the canoe club from the water. 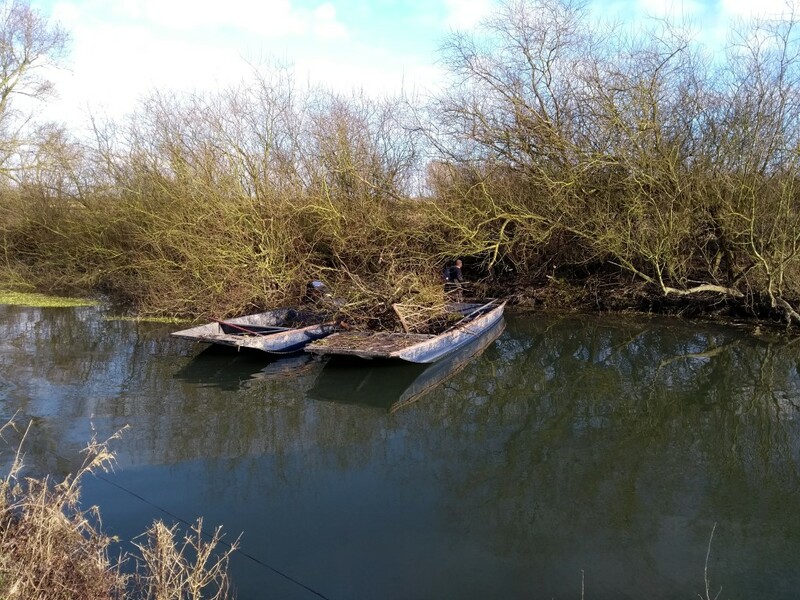 We hope to keep it in place as long as possible, but if it starts to cause a problem when river traffic increases after Easter, please let us know and we will remove it. 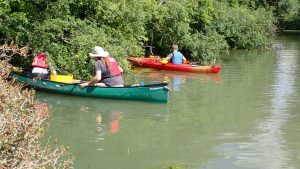 We need volunteers to join us in helping keep it (and the rest of the upper Cam) clear of Floating Pennywort, so if you would like to help, do register here. 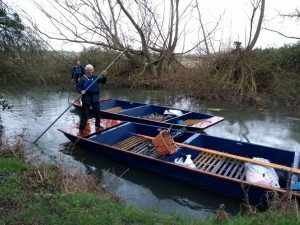 Given the link between Floating Pennywort infestation and climate change (warming increases the growing season), we are quietly pleased how much of the job was human-powered. Then towed up the river….